A rare and exceptionally large serving tray by Jean Puiforcat (1897-1945) Puiforcat, who spent four years in Mexico during World War II, designed this tray during his Mexican years. 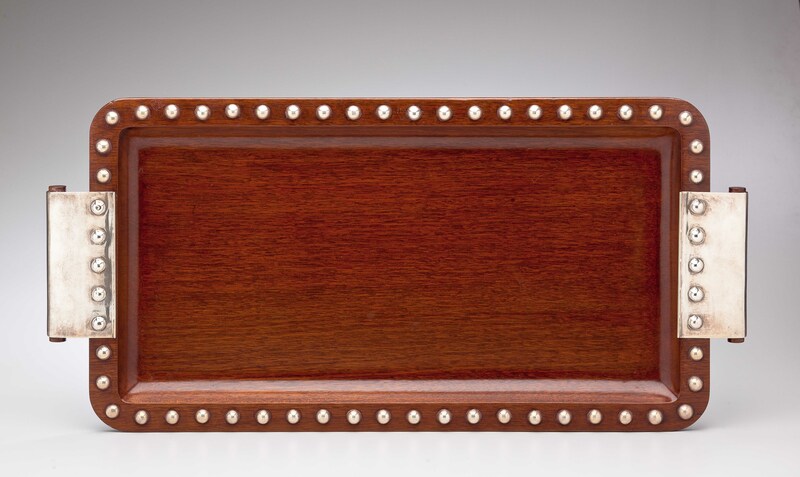 The tray is made of an exotic wood, probably mahogany, with sterling silver handles and a border of silver studs decorating the rim. Signed Jean Puiforcat, Made in Mexico, JP, the artist's hallmark. Illustrated "Jean Puiforcat" by Francoise de Bonneville, Paris, 1986, p. 179. Provenance provided upon purchase. Over all good condition. Tarnish and one button on underside replaced. Two silver buttons on underside of handles with cracks and losses. Nicks and scratches to underside of wood.